After reffering many guides and doing a lot of research on internet, I founded a working and effortless method .I have personally tested this on my friends phone.People who have not rooted yet ,simply get your YUphoria rooted and Enjoy the freedom Of YU Play God. Step1: You must have YUphoria Phone. Step 3:Now Scroll down And then go to About Phone option. Step 4: Now in about phone Scroll down and tap build number 5-7 times unless and until you see the option 'You are now a developer'. Step 5:Now Go back and now Developer Options will appear in Your settings just Above the About Phone option. Now Tap on it Now you have to turn on the toggle seen at the Top. Step 6: Now You have to Open Developer Options in your Phone YUphoria and just turn on the option " Advanced reboot"
Step 7: scroll down You will see the option "turn off Update Cyanogen recovery"
Step 8:Now Just go down and turn on the option Android/USB Debugging. Keep a backup of all your data in the Internal Memory to be safe as your bootloader may or may not be unlocked. Make sure That you have at least 35% battery In your phone to avoid Unexpected failures. Download and install PdaNet Drivers to connect your YUphoria to PC in stand-by mode. Extract/Unzip the YUphoria Root Files. Now paste the Root.zip (SuperSU.zip) file in Your Internal Memory or SD card of your YUphoria Phone. Always Check the latest version of SuperSU.zip from the link below before using it. -=>Now You have to Download YUphoria CWM recovery if you want to flash your CWM custom recovery. Note: Better use latest TWRP 2.8.7.0 and Copy and paste it into YUphoria Root Files before flashing. Now Install PdaNet drivers in your PC/Laptop while connecting YUphoria in standby mode. NOW You have to Press Power button and now select and hold Reboot. You will be getting four options in that . Select the one which states Bootloader. Fastboot Mode or bootloader will be now be visible To ur YUphoria. 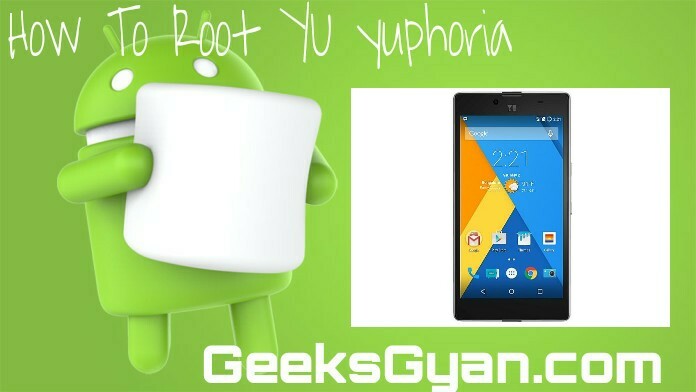 Now Navigate to the extracted YUphoria Root Files folder located in your PC and now open YUphoria rooting. Now press The Shift key on your keyboard, right click in that folder in blank area and Open Command Prompt there. The command prompt will now open up. Run the following command in command prompt for confirming that your YUphoria is detected by PC in Fastboot Mode or it has not detected. The device should be detected to proceed further. If it is unlocked,no need to unlock the bootloader. Caution: Keep Backup of your data before going running the above command as unlocking the bootloader will erase all your data. Now After successful successful attempt,Disconnect the data cable from your YUphoria and press Volume Up+Volume Down+Power button Together. By this YUphoria will booted into recovery mode TWRP which is flashed by you. Go Back and Select The Wipe Cache Partition and then Yes Wipe. Now It will take about 2-3 minutes to wipe it . Now just Select advanced and select Wipe Dalvik Cache and then Yes Wipe. Note : It may take time to reboot the device depending upon the apps you have in your phone. So, please Be patient. Congratulations,Now Your YUphoria phone is finally rooted. Final note: For checking that you have successfully rooted your device or not, just download Root Checker app from google playstore. Stay Happy and comment if any problem below!! !